22:50 That's it in terms of sport for this evening I'm afraid. I'm going to go bathe my blistering fingers after ferociously trying to keep up the all the medal action from this evening. For now though, it's goodnight! 22:40 It's all over in the tennis where Switzerland's Jil Teichmann and Poland's Jan Stanislaw Zielinksi have completed the comeback. The pair were a set down in this mixed doubles gold medal encounter but bounced back to dominate the second and take the tie-breaker 10-4. The China/Japan love story doesn't quite go all the way but a well deserved silver nonetheless. Bronze was won by Poland's Kamil Adrian Majchrzak and Hungary's Fanni Ivett Stollar. 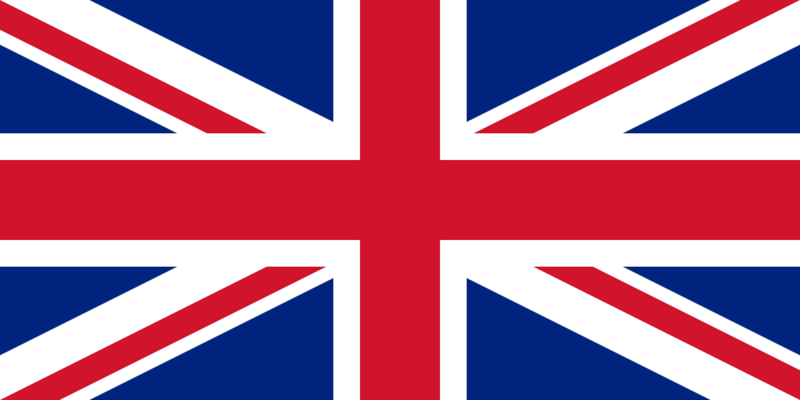 22:34 "Are you England in disguise, are you England in disguise!" - that must have been the cheers ringing out from the JSC Stadium as South Korea progress to the men's football final with a 3-1 penalty shootout win over Finland. Two misses on the bounce for the Finnish left them dead and buried as Korea converted both their openers. Finland pulled it back to 2-1, however, a "Pirloesque" dink down the middle by South Korean captain Mingyu Kim pulled them clear again with a great save by Seungha Kim setting off the Korean celebrations. A definite case of defenders syndrome there by Mingyu. He was given the opportunity to shine wasn't going to settle with the simple. A great penalty to end the contest. He'd have been in the doghouse if he'd missed it, however. South Korea to play Peru in the final. 22:30 And it's a shootout in the football! The match ends all square at one apiece and, with no extra time at the Youth Olympic Games, will now give way to the dreaded penalty shootout. 22:23 There is just two sports still in action here in Nanjing at the minute with semi-final action in the football and final action in the mixed tennis doubles. The football sees South Korea and Iceland all square at one apiece coming into the last five minutes. 22:10 Big news from the athletics track where it has been announced that Jamaica's Chad Walker has been disqualified from the men's 200m. The Jamaican ended the race in the silver medal position but will forfeit the medal as per IAAF rules. Organisers have said he was disqualified under rule 163.3a which states: "In all races run in lanes, each athlete shall keep within his allocated lane from start to finish. 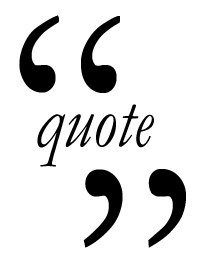 This shall also apply to any portion of a race run in lanes." Silver will now go to Botswana's Baboloki Thebe with Taiwan's Chun-Han Yang moving onto the podium in third. 22:02 The final gymnastics gold is in and it goes to Japan's Kenya Yuasa on the men's horizontal bar. The Japanese gymnast was the top qualifier for the apparatus and put in a 13.700 to secure gold in the final. Belgium's Luka Van Den Keybus seals silver while Giarnni Regini-Moran adds yet another medal for Great Britain in third. 21:56 The final result from the athletics is in and it's gold for Russia in the women's shot put. Alena Bugakova is the one to take it as she throws an impressive 18.95m. Mexico's Maria Fernanda Orozco Castro wins silver with a throw of 17.55m, just 0.24 metres ahead of Germany's Anika Nehls. 21:50 Hlib Piskunov has added a second Ukrainian gold in the athletics as he throws a personal best 82.65m to win the men's hammer throw. Bronze goes to Egypt's Ahmed Youssef with a personal best of 78.59m. 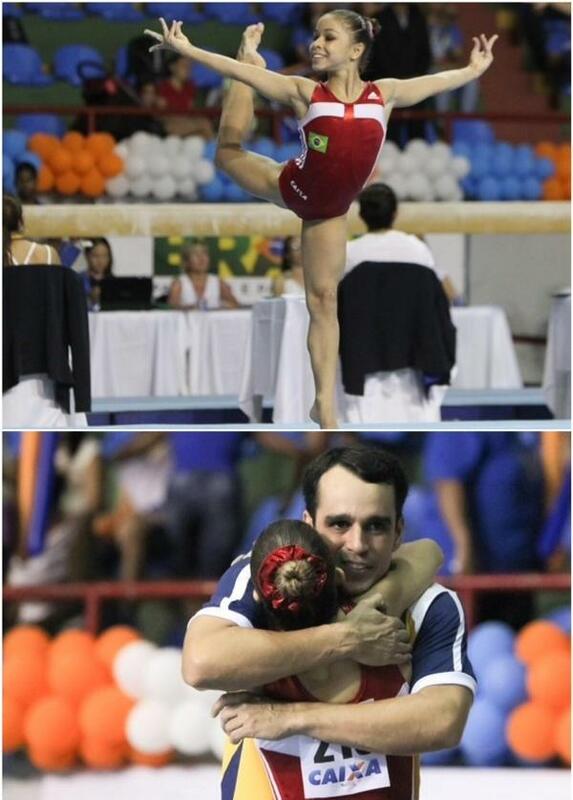 21:43 A second medal for Brazil's Flavia Lopes Saraiva in the gymnastics, and this time it's gold! The Brazilian outclasses the rest of the field in the women's floor exercise to secure the victory, finishing ahead of Russia's Seda Tutkhlyan and Great Britain's Elissa Downie. 21:30 We're nipping back to the track now though because America's Noah Lyles has won the men's 200m final in a time of 20.80. The America blew apart the field to secure the gold, with Jamaica's Chad Walker in second and Baboloki Thebe of Botswana in third. 21:13 We apologise for the lack of action outside of the gymnastics and athletics over the past hour or so. A mad scramble to find out who has won what following a something of a technical difficult in the Nanjing 2014 camp has held our attention. I can tell you that The Netherlands and China will meet in the women's hockey5s final after victories over Argentina and Japan respectively. It's all square at 19-19 in the second men's handball semi-final where Norway are taking on Slovenia. The winner of that will face Egypt in the final. As for the mixed doubles final. A quick investigation has allowed us to discover that the match has been rescheduled to an inside venue due to the rain delays from earlier. Japan's Jumpei Yamasaki and China's Qiuyu Ye make a welcomed pairing in this match, with the duo facing Switzerland's Jil Teichmann and Poland's Jan Stanislaw Zielinksi. It's a game all in that one as the first sets gets underway. 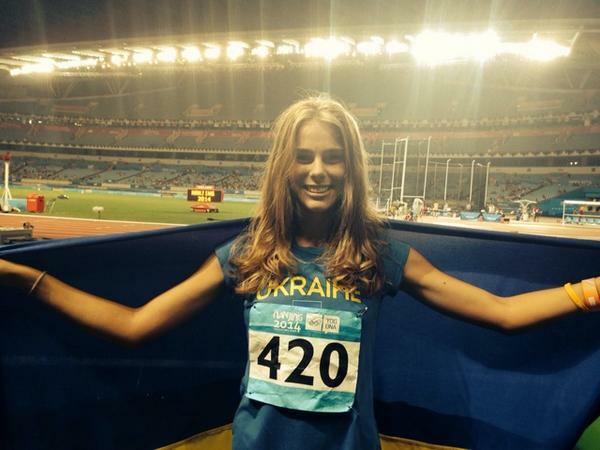 20:58 Back to the athletics and Yuliya Levchenko wins gold for Ukraine in the women's high jump. Lechenko jumps a personal best 1.89m to seal the win with France's Nawal Meniker settlign for silver as she fails three times to match the Ukrainian's height. Bronze is won by Michaela Hruba of Czech Republic. 20:45 Russia's Nikita Nagornyy has been on fire at these Games and that trend doesn't look like stopping now, The Russian adds a third gold medal in the parallel bars to take his overall medal tally to five. Great stuff. Silver goes to Hungary's Botond Kardos while Great Britain's Giarnni Regini-Moran settles for bronze. 20:37 Yomif Kejelcha of Ethiopia wins the men's 3,000m at a canter, finishing in 7:56.20, almost ten seconds clear of the opposition. Burundi's Thierry Ndikumwenayo is the man to follow him as he takes silver while Kenya's Moses Koech is a fraction of a second behind in third. 20:28 And we've got a second Japanese gold of the night on the track as Nozomi Musembi Takamatsu seals the deal in the women's 3,000m with a time of 9:01.58. Silver goes to Germany's Alina Reh while Ethiopia's Berhan Demiesa Asgedom takes bronze. 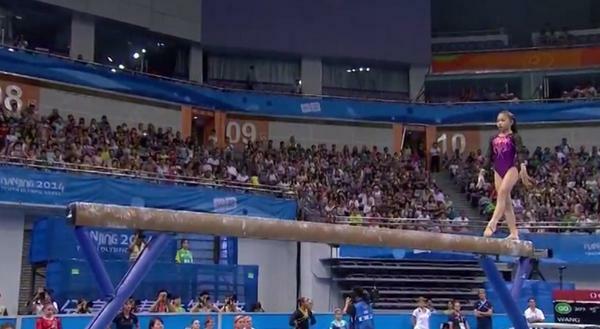 20:12 There's been a Chinese victory in the gymnastics with Wang Yan taking gold in the women's beam. The 14-year-old (yes 14!) seals the win ahead of Brazil's Flavia Lopes Saraiva and Great Britain's Elissa Downie who come in second and third respectively. Mexico's Noel Ali Chama Azazon had led for most of the way only to be dropped on the last lap. But he rallied well to stay in third place, and very nearly pip Sarakin and take second. 19:55 A fourth gold of the Games for Poland as Konrad Bukowiecki throws a personal best 23.17m to secure victory in the men's shot put. His second attempt throw is a whopping 2.17m ahead of Romania's Andrei Rares Toader who takes silver. Germany's Merten Howe is the only other athlete to break to 20m mark as he seals bronze. 19:49 China are off the mark in the athletics as Xinying Xu wins gold in the women's hammer throw with a personal best throw. The 17-year-old matches Australia's Alex Hulley throw of 68.35m with her final attempt but takes the gold due to having a better throw in other attempts. Hulley, therefore, has to settle for silver with Hungary's Zsofia Matild Bacskay in third. 19:43 Results from two semi-finals to bring you know as Egypt power to a 34-26 victory over Qatar in the first of this evening's men's handball semi-finals, while over at the football, Peru have cemented their place in the men's final after coming from behind to be Cape Verde 3-1. "The upper tiers of the stadium may still be virtually empty here at the Nanjing Olympic Sports Centre Stadium, for my first trip to this venue since the Opening Ceremony eight days ago. It is beginning to drizzle very lightly here as well, but the atmosphere is bubbling nicely nonetheless, particularly whenever an announcement is made in Chinese. At the moment we have the men's 10km race walk on the track and the girl's hammer in the infield. I have been watching athletics for quite a few years, but I can't remember ever focusing on either of these events before, Racewalking in particular makes me recall a rather embarrasing occasion on which I was beaten by one in a training run... There is a four strong leading pack at the moment, with walkers from Mexico, South Korea and Russia represented. 3,000m left." 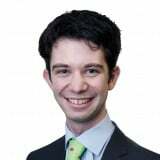 - Nick Butler has made the short trip over to the stadium for a frantic night of athletics action. 19:38 Great Britain claims gymnastics gold as Giarnni Regini-Moran secures victory in the men's vault! That's a third gold medal of the Games for the young Briton, more than half the nations total gold medal haul. His score of 14.695 was enough to see off competition by China's Yue Ma and Russia's Nikita Nagornyy who finish second and third respectively. 19:34 Brazil's Orlando Moraes Luz and Marcelo Zormann Silva have won the men's doubles final in the tennis. The duo won the first set only for the Russian pairing of Karen Khachanov Andrey Rublev to level the tie in the second. That left a tie-breaker to separate the two teams with the Brazilians pulling through to take it 10-3. Bronze was won by Japan's Ryotaro Matsumura and Jumpei Yamasaki yesterday. 19:26 Today marks the final day of preliminary round action in the 3x3 basketball with a long list of results to bring you know. The women's contest has seen wins for China, Taiwan, Hungary, Belgium, Spain, Andorra, Slovenia, Thailand, The Netherlands and Czech Republic, while on the men's side Puerto Rico and Venezuela have both tasted success this evening. The men's competition will continue until around 22:00 this evening with France and Lithuania currently on court. 19:14 The men's vault will open the final night of apparatus action at the Nanjing Olympic Sports Centre Gymnasium with the men's parellel bars and horizontal bar, along with the women's balance beam and floor exercise also set to take place this evening. 19:05 First up on the track is the men's 10,000m race walk. There's also field action in the men's shot put and women's hammer throw. 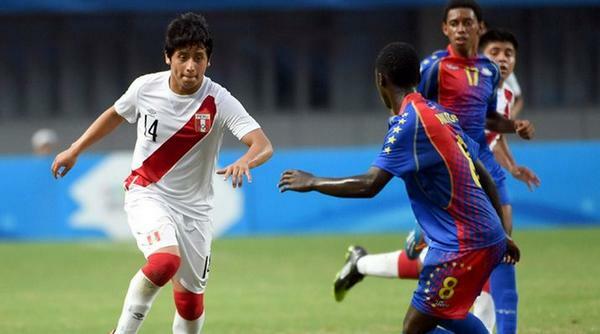 18:59 Pre-tournament favourites Peru have turned around a one goal deficit to lead 2-1 in their men's football semi-final encounter with Cape Verde. They look on course to face the winner of the South Korea v Iceland match that follows. 18:58 Tennis' men's doubles gold medal final has entered the second set after a 7-5 opener in favour of Brazil's Orlando Moraes Luz and Marcelo Zormann Silva. They are facing Russia's Karen Khachanov Andrey Rublev. 18:51 Russia have claimed gold in the men's modern pentathlon as Aleksandr Lifanov swims, stabs, runs and shoots his way to victory. The Russian began the day with a 16th place finish in the swim, but surged up the leaderboard with a third in the fencing before securing the gold in the combined shooting/running, where he came in second. His final score of 1184 is just nine points clear of Hungary's Gergely Regos while Lithuania's Dovydas Vaivada finishes a further 24 points back in third. 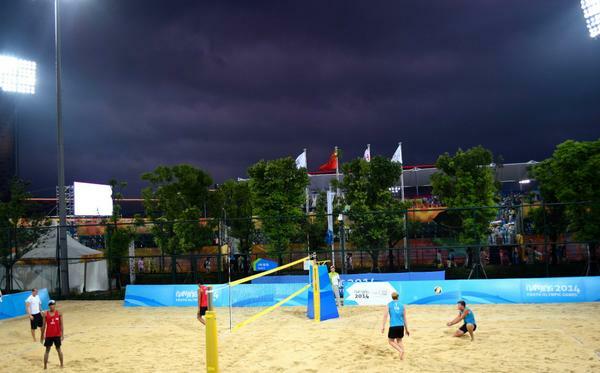 18:38 The knockout phase of the beach volleyball has also been underway today with the round of 24. All matches are over in this stage with the men and women now back on the sand for the round of 16. This round has seen wins for Argentina's Camila Hiruela Tapia and Irene Verasio, and Brazil's Eduarda Santos Lisboa and Ana Patricia Silva Ramos in the women's, and Russia's Oleg Stoyanovskiy and Artem Iarzutkin in the men's. On court at the minute is the men's match between Uruguay's Mauricio Sebastian Vieyto Acosta and Marco Cairus Lucarelli, Thailand's Surin Jongklang and Banlue Nakprakhong. 18:29 Talking of semi-final action, there's been a lot of it in the boxing this afternoon. To keep it simple. here are the finallists in each of the weight categories following victories in the ring today. Irma Testa of Italy and Yuan Chang of China. Jajaira Gonzalez of United States and and Ciara Ginty of Ireland. Blagoy Naydenov of Bulgaria and Vadim Kazakov of Kazakhstan. Further semi-final action will continue this evening from 19:00. 18:12 Fiji have ended the women's hockey5s competition in last following a 6-1 loss to Zambia in the 9-10 classification playoff. In the business end of the contest, The Netherlands are currently beating Argentina 2-1 in the semi-final. China and Japan play later. 18:01 The Chinese medal storm is building momentum (again) as Hao Yang seals gold in the men's 3m springboard. The 16-year-old led from start to finish, ending with a score of 613.80 to ensure the victory. Mexico's Rodrigo Diego Lopez was well clear in silver while Canada's Philippe Gagne claimed bronze following a disappointing final dive by Germany's Timo Barthel. 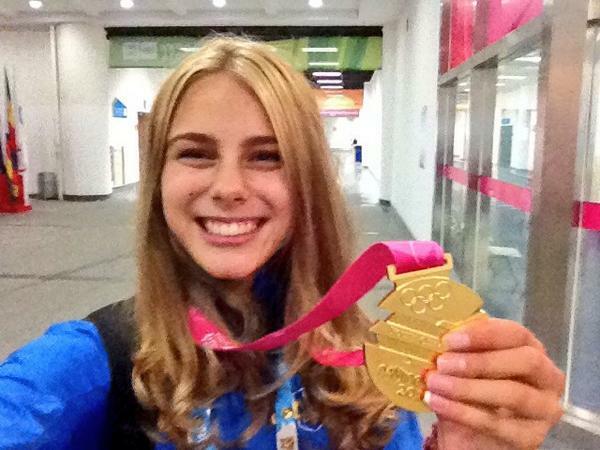 17:53 Emily Fraser's jumping gold medal was a first at the Youth Olympic Games. Here she is celebrating the brilliant achievement. 17:47 Shilin Xu takes women's singles gold in the tennis after overcoming Belarus' Iryna Shymanovich in the final. Xu took the the first set 6-3 before strolling to a comfortable 6-1 victory in the second. Bronze was picked up by Lithuania's Parazinskaite in yesterday's bronze medal playoff. 17:42 In the second phase of the men's modern pentathlon, Hungary's Gergely Regos and Bulgaria's Yavor Pehsleevski have recorded 300 points apiece to lead the way in the fencing. 17:38 A Chinese/Filipino duo has won the mixed international team archery competition as Jiaman Li and Luis Gabriel Moreno record a 6-0 victory over German's Cynthia Freywald and Malaysia's Muhamad Zarif Syahiir Zolkepeli in the final. Bronze was picked up by the Canada/Finland pairing of Eric Peters and Mirjam Tuokkola following a 6-2 win over Belgium's Rick Martens and Guatemala's Regina Romero. 17:31 It's a familiar sight over at the Natatorium where China's Hao Yang leads in the men's 3m springboard final. 17:23 Russia's progress to the women's handball final has been confirmed as the team records a comfortable 30-22 victory over Brazil. They will now face South Korea in the final after the Asian side narrowly edged Sweden in the earlier encounter. 17:17 And it's New Zealand's Emily Fraser who takes the gold. Fraser and Argentina's Martina Campi both recorded a flawless round, but it was the Kiwi who sealed the win as she finished 0.20 seconds quicker their her south American counterpart. Jake Hunter of Australia seals the bronze. 17:02 But no, Eastern Europe are back, and Belarus in particular must be absolutely loving this rowing and canoe sprint venue. Stanislau Daineka has just won the K1 event to close proceedings. A time of 1:36.913 to beat Milan Mogzi of Hungary. Vladislav Oleynikov of Russia takes bronze. 16:55 Inna Nikitina of Russia has won the girl's K1 canoe sprint event, crossing the line in 1:49.922 to defeat Luca Homonnai of Hungary. Camila Aldana Morison Rey takes bronze for Spain, in a rare break to the Eastern European dominance we have seen. 16:49 And a first set result to bring you in the girl's singles tennis, now that the weather-induced delays have ceased. Xu Shilin of China has taken it, 6-3, over Iryna Shymanovich of Belarus. The Belorussian is bidding for her second gold following her girl's doubles victory yesterday. 16:46 We are flying through these canoeing finals but a quick update from elsewhere. There will be a jump-off in the showjumping as Sabrina Rivera Meza of El Salvador, Martina Campi of Argentina and Jake Hunter of Australia join Emily Fraser of New Zealand in managing a double clear round. Russia are about to confirm their handball victory over Brazil, although the South Americans have continued to battle hard. 16:40 Serghei Tarnosvschi has won the first Moldovan medal of the Games, and it is a golden one. His time of 1:57.688 is good enough to beat Vadim Korobov of Lithuania. Moldova has won seven Olympic medals, plus two Youth Olympic ones in Singapore, since becoming an independent from the Soviet Union. But this is its first ever gold! The bronze medal was won by Krystof Hajek of Czech Republic. 16:36 Kamila Bobr of Belarus wins the first gold medal in canoe sprint, the C1 event. She beats Ukraine's Liudmyla Luzan by five and a half seconds with a clocking of 2:21.640. Victoria Morales-Carales of Mexico wins the battle for bronze. 16:29 Russia lead Brazil 17-7 at halftime so are on course for a final with South Korea in the girl's handball. 16:21 A couple of penalties for Al Qadi to add to his single one yesterday and he is down in a share of sixth place, along with British Flagbearer, Jake Saywell, and two others. The World Equestrian Games are, of course, just getting underway in Normandy, so a big moment for the sport. It must be the only non-team Olympic sport to only have World Championships on a quadrennial basis, I feel. 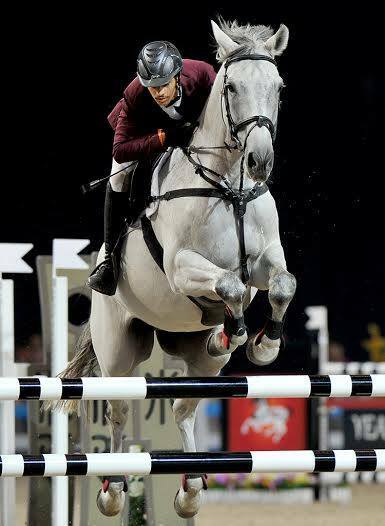 "It's a thrilling day for Qatar's youth Olympic team in Nanjing, China as Hamad Al Qadi participates in the final round of the Equestrian jumping competition followed by the Qatari youth handball team with their Egyptian counterparts in the semi-finals round"
16:13 Well underway now in the showjumping individual competition. First round yesterday and second today, and only one competitor has gone clear in both so far - Emily Fraser of New Zealand. At the moment, she is heading for gold. 16:05 The second semi-final is underway in handball, between Brazil and Russia. A huge bodycheck by a Brazilian on a Russian player there, more akin to american football or rugby than this sport. She receives a yellow card, and this is clearly another tenaciously competitive encounter. Russia have edged clear in the opening period. 15:56 Two semi-finals have taken place in canoe sprint and the two more are up next before the finals later. 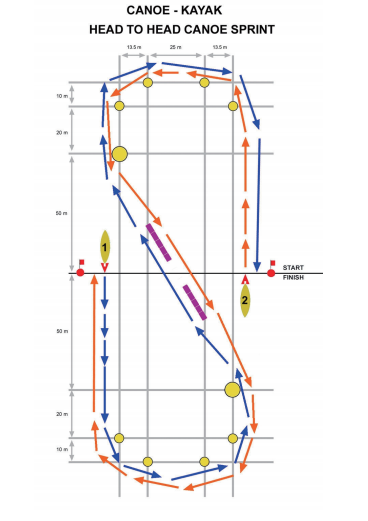 Action is taking place over a 420m twisty-turny course, which is outlined below. Kamila Bobr of Belarus will face Liudmyla Luzan of Ukraine in the girl's C1 final. and then we are guaranteed the first Moldovan medal of the Games as Serghei Tarnovschiis through to face Lithuanian Vadim Korobov in the boy's final. The girl's singles and boy's doubles finals followed by the gold and bronze medal matches in the mixed doubles are being played today. And a Japanese and Chinese pair are playing together in the mixed doubles final: Jumpei Yamasaki and Ye Quiyu are up against Jan Stanislaw Zielinski and Jil Teichmann of Switzerland. 15:37 If you didn't see it a few days ago, here is our piece on the sport: "Wushu has a bright future in the Olympic Movement, claims world governing body". 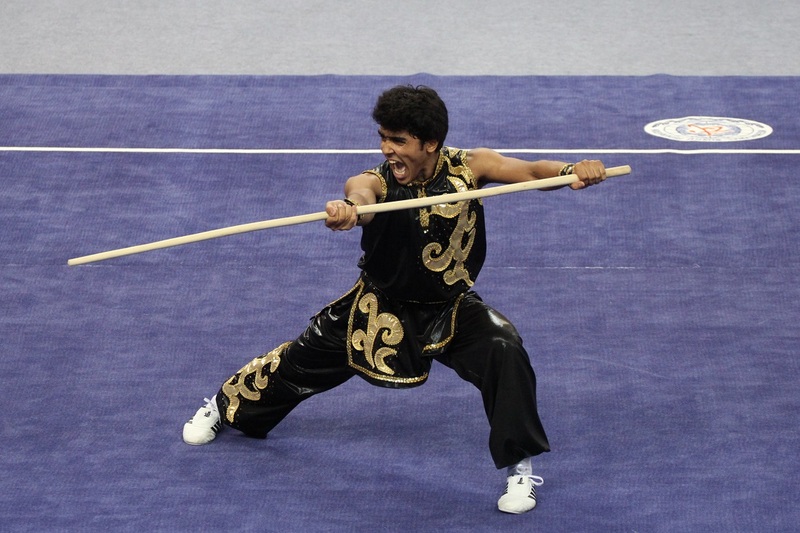 We will be going back to the Sports Lab to have another look at wushu, along with the three other exhibition sports, over the next few days. 15:29 At the same time as being showcased at the Sports Lab, a wushu tournament has also been taking place here over the last three days. 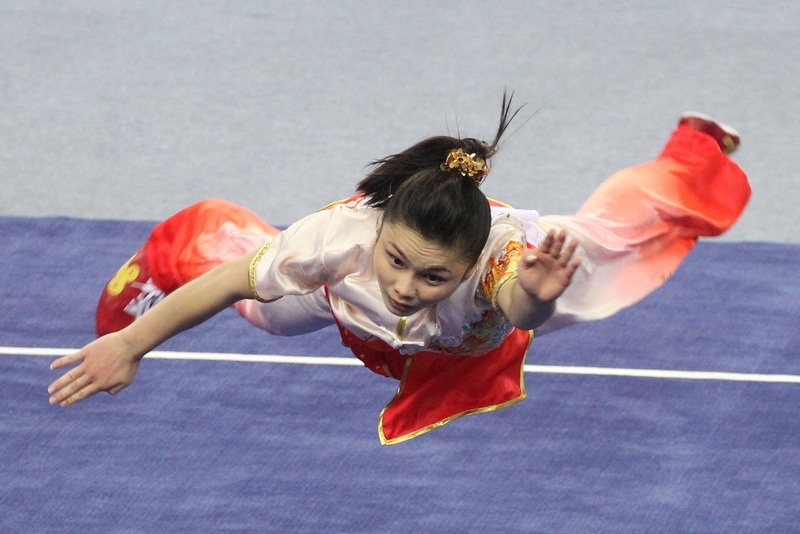 The Nanjing 2014 Youth Wushu Tournament, to be precise. 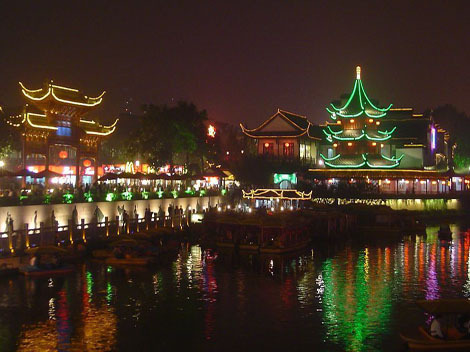 Held in the Gaochun District of the city, it is part of the IOC's Culture and Education Programme. 15:15 There will be a 30 minute delay until action begins in the canoeing as a result of that downpour. It will happen at the same time as the showjumping later. And then a barrage of more medals will be won in the evening. Archery, modern pentathlon, diving, athletics - a lot of athletics - tennis and gymnastics. 15:01 After their girl's medal yesterday, Britain have made a good start in the boy's modern pentathlon. Henry Choong has won the 200m swim with a rapid 1:57.21. The fencing final round and then the combined run-shoot are still to come. 14:53 We will find out if any sports have been affected by the weather, but in the meantime the handball semi-final has finished. And it is South Korea who take the win. A brilliant match but the South Koreans edge home 25-24. The Swedes will still have a chance of a medal but the Asian side are through to the final. They will face either Brazil or Russia. 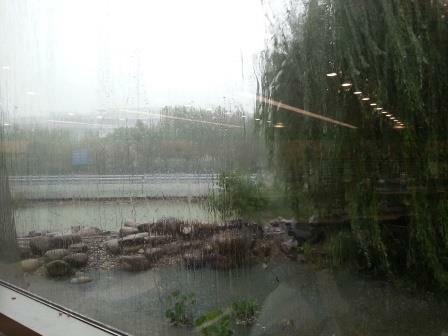 14:34 We were about to give you a preview of the canoeing action but, suddenly, an explosion of thunder reverberates across the press room and it appears the storms we were promised have arrived. Great timing for the sailing. That's about the first time this week we can say that. 14:20 Handball action is really hotting now in this semi-final. We have had a fair few mismatches in some of the team sports here in Nanjing, so it is great to see a really close one. Every save from each goalkeeper is crucial, but also every faulty attack is potentially fatal... South Korea have fought back to take a one goal lead. 14:05 China have their first gold medal of the day, courtesy of Wu Linli in the girl's windsurfing. She becomes the first Medal Race winner to also win overall, to win by eight points from Mariam Sekhposyan of Russia. In third place, it is Lucie Pianazza of France. After a steady start, Wu won four of the last five races and came second in the other. Dominant stuff from the Chinese windsurfer. 13:58 Their junior counterparts are doing rather well but South Korea are fighting hard. It was briefly 14-12, but now it is 14-13 with the Europeans still in front. Just. 13:48 Back in the handball as Sweden have edged clear in this nip and tuck semi-final as the second period begins. They lead 13-12. Team #ukraine won 19 medals at the moment in @nanjing2014yog - exciting Independence Day present from young athletes.More to come! Happy birthday, my beloved #Ukraine! Be peaceful, be strong, be united, be happy and prosperous! Proud to be Ukrainian! 13:35 Over at the Zhongshan International Golf Club, Italian pair Renato Paratore and Virginia Elena Carta have completed their round in a stunning 62, for 10 under par. The duo are one shot clear of Brett Coletta and Elizabeth Elmassian of Australia, who are still playing the 18th, with Norway two shots further back in third place. Two more days of action to come there, remember, before the medals are won. 13:27 The girl's windsurfers are out on the water, but there is also handball semi-finals action going on, with South Korea leading Sweden 11-10 at the JSC Gymnasium after the first period. 13:18 Gold for Argentina in boy's windsurfing as Francisco Cruz Saubidet Birkner's wins after a thrilling Medal Race. Maxim Tokarev of Russia was finishes third in the Medal Race, to the Argentinian's second, to leave both sailors on a total of 19 points. But in the case of a tie, the final race is declared precedence so the South American is the winner. 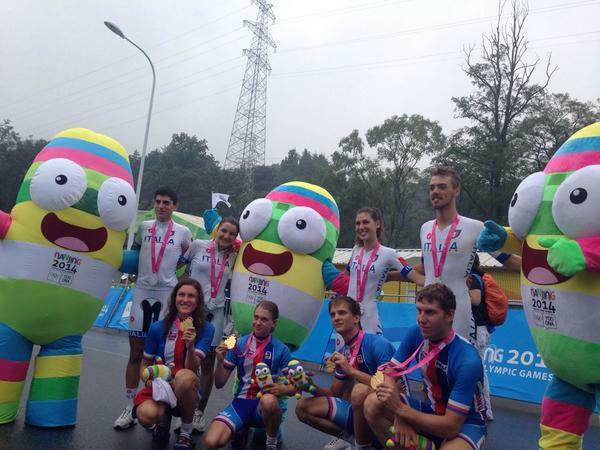 The host nation of the next Summer Youth Olympic Games duly win their first gold of the Games. They are a strong sailing nation, having won medals in the sport at Athens 2004, Beijing 2008 and London 2012. Lars van Someren takes bronze for The Netherlands, with Tom Monnet of France having to be content with fourth place despite winning that final Medal Race. 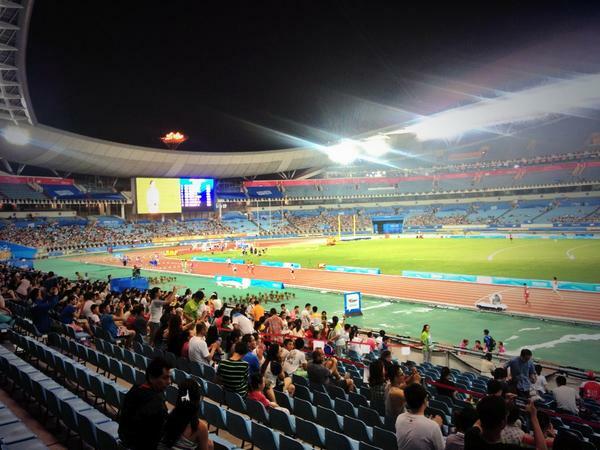 13:10 So...underway now in the final two sailing events of Nanjing 2014. 12:58 It's still a few days away but an update was provided yesterday about the ticket selling process for the Closing Ceremony, with tickets selling out fast, Zhang Dongxin, Closing Ceremony director, said it will be fill of "passion", with some of China, and the world's top singers and artists performing. We will bring you more glimpses of what is to come over coming days, and we hope it will follow the success of the Opening Ceremony here eight days ago. Tickets for the Closing Ceremony are selling at four different prince brackets, and Zhang Wen, a volunteer, said she has seen many people turned away from the main stadium because they did not book tickets in advance. "It's China," Zhang said. "Too many people want to buy tickets before you do." About 410,000 tickets for various events have been sold so far, it was revealed. "Almost half the total sales of tickets are made by students and families," said Han Dong, assistant director of the marketing department of Nanjing 2014. "The Youth Olympics is for the youth, so we made a plan to offer more tickets, at affordable prices, to students and families at first." They can be bought on the Nanjing 2014 website, or in China at box office outlets, including China Post, China Telecom and the Industrial and Commercial Bank of China. 12:48 There has been a slight calm before the storm in a sport as well as a meteorological sense over the last few minutes, but the handball semi-finals and the final two sailing medal races are beginning soon. And there there will canoe sprint and equestrian medals action this afternoon. 12:36 While we are providing a team sport update, the football semi-finals are coming up this evening: it's Peru versus Cape Verde, followed by Iceland against South Korea. In the FIFA senior world rankings, that would be the world number 52 against 72, followed by 46 against 57. 12:27 An update ahead of the girl's semi-finals in hockey 5s. The second encounter, between China and Japan, should be especially interesting... The boy's matches follow tomorrow. "The men's quarter-finals were dominated by the teams who had played in Pool A in the group stage, with all four teams making their way through to the semi-finals. Spain had finished first in the pool, and sailed past the fourth-placed team from Pool B, Zambia, with double digits. Second placed Australia equally had little difficulty to get past Mexico. Third-ranked Canada were in for an epic battle with Pakistan. A total of fourteen goals in regulation time were not enough to separate the teams, with Pakistan scoring in the very last minute to force the Challenge Shoot-out. There, Canada kept their cool and took the crucial win. Lastly, the South African men stunned Pool B champions New Zealand in a tense encounter. In a match that could have turned at any given moment, a hat-trick by Nqobile Ntuli bought the Africans a ticket into the semi-finals. On the women's side, the Pool A teams also dominated, with the Netherlands, Argentina and Japan moving through to the next stage with ease. Only Pool B Champions China could make their way into the semi-finals, much to the joy of the home team's numerous fans." - The FIH update us on the latest situation in hockey5s, ahead of girl's semi-finals day. 12:15 And it is followed almost immediately by a second gold for the Asian nation, as Samantha Yom finishes second in the medals race to take the overall girl's Byte CII Dinghy title. Odile Van Aalhold of The Netherlands takes silver, and bronze goes to Jarian Brandes of Peru. Dolores Moreira Fraschina of Uruguary won that Medal Race, but only finishes ninth in the overall standings. 12:10 Gold goes to Cheok Khoon Bernie Chin of Singapore, who finished fifth in the medals race, ahead of Rodolfo Pires of Portugal and Jonatan Vadnai of Hungary. 12:06 Azri Azman wins the medal race in the boy's dinghy class, ahead of Henry Marshall of the US but he will only finish in eighth place overall, with Marshall fourth. 11:58 In the opening series of races, competitors score points depending on the position they finish in, so a low score is the target, with their lowest finishes discarded. 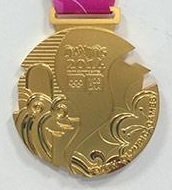 In the medals race, discards are not permitted, and points count doubles. It is the two dinghy races up now, nearing completion, with windsurfing competitions to come this afternoon. 11:51 You may have to read this twice to quite believe it, but sailing action is now going on here at Nanjing 2014. "It should be race on for the final day of the Youth Olympic Sailing Competition with rain bringing breeze to Lake Jinniu. After three frustrating days for the 101 sailors from 62 nations the rain and wind is a welcome changed from the heat and lack of breeze. At 10:00 local time a breeze in the region of 5 knots was present on the race course and is expected to pick up slightly as the day progresses. China's Linli Wu is perfectly primed to take gold for her nation in the Girl's Techno 293 fleet. The Chinese sailor is seven points clear of Russia's Mariam Sekhposyan and France's Lucia Pianazza and needs to finish seventh or better to claim gold. Wu has yet to finish outside of the top seven and has mastered the light winds of Lake Jinniu so she will be hard to overthrow on the final day." 11:38 A good win for Angola, 31-15, over China in the girl's handball competition, in the fifth to eighth place classification matches, with Brazil currently leading Tunisia in the boy's match. Later on we will have the two girl's semi-finals: South Korea versus Sweden followed by Russia against Brazil. 11:31 Mixed team action has begun this morning in archery ahead of medals being decided later on. Each team consists of a player of each gender, with mixed international teams permitted although most seem to be from a single country. Matches consist of four sets of four arrows each with the 122cm target face split into ten rings, with a greater number of points allocated for each ring depending on how central it is. A mixed team has 80 seconds to shoot four arrows in alternate format. The eight teams to have made it through to the last 16 this morning are Azerbaijan, Japan, China, Philippines, Finland, Canada, Brazil, Kazakhstan, Guatemala, Belgium, Belarus, Taiwan, Great Britain, Malaysia, Germany, and a second Japanese team. Speaking earlier in the week, World Archery chief Ugur Erdener spoke optimistically about this event featuring on the Olympic programme one day. 11:23 Speaking of stories on insidethegames, here is our interview with Lillehammer 2016 chief executive Tomas Holmestad: "Dog-sled racing at Lillehammer 2016? 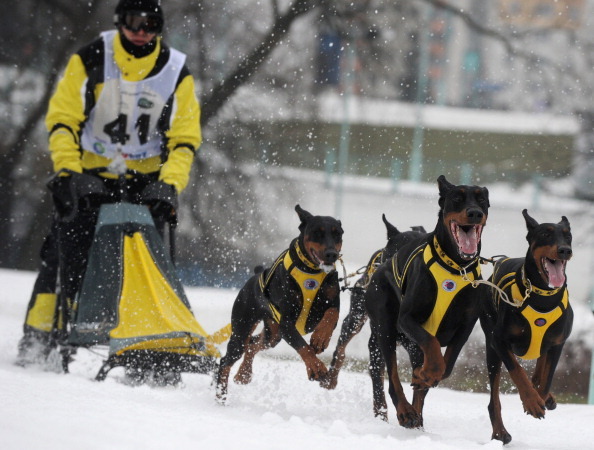 Chief executive would love to see it"
Could there be dog-sled racing at the next Winter Youth Olympic Games? 11:15 That medal seems an appropriate time to plug a story we did yesterday: "French speaking National Olympic Committees hold meeting in Nanjing to try to protect identity"
We wrote then that no majority-French speaking countries - except France, Switzerland and Belgium - had won medals here in Nanjing, but obviously that situation has now changed. 11:10 Both Czech medals in Nanjing have now come in cycling, but it was a first medal of these, or any Youth Olympics Games, for Djibouti in the 1,500m earlier. The tiny East African country on the Gulf of Aden has won one medal in the senior Olympics, a bronze for marathon runner Houssein Ahmed Salah way back at Seoul 1988. Although orginally from Somaliland, the double Olympic, world and European 5,000 and 10,000m champion Mo Farah grew up in Djibouti before moving to Great Britain at the age of eight. 11:00 A sensational victory for Czech Republic in the mixed team cycling as Nikola Noskova claims gold despite crossing the line in exactly the same time, 17:31, as Sofia Beggin of Italy. That is sweet, sweet revenge following the girl's team event, where Italy pipped the Czechs to gold. Ukraine hold on for bronze after another hotly contested finish, with Japan and Kazakhstan on this occasion. 10:54 There is rain falling in the Olympic Sports Centre now, so that performance is even more remarkable from Whyte... just like Soet's was a little earlier. 10:52 Natalliah Whyte of Jamaica wins the girl's 200m. A great start and then she never looked threatened to win in 23.55. In second place was Dzhois Koba of Ukraine in 23.94 with Brandee Johnson of the US taking bronze. Whyte came seventh at the World Junior Championships in Eugene earlier this summer, albeit again people who are too old to compete here. 10:45 Cracking finish on the cards after Roman Lehky of Czech Republic and Manuel Todaro of Italy cross the line within a second of each other on leg three. There's then a 32 second gap to the chasing pack, led by Ukraine and Japan. 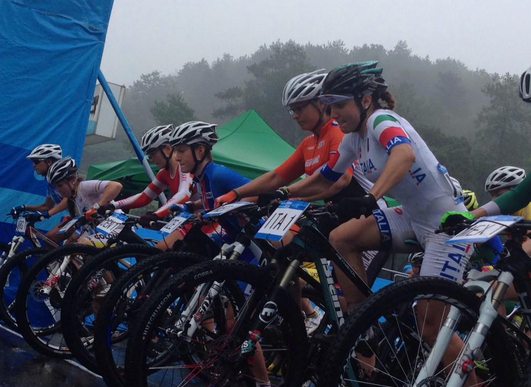 10:36 Action, meanwhile, is well underway in the mixed team relay in cycling. Each team consists of two boys and two girls, with the race consisting of a male and female cross country leg followed by a male and female road time trial, albeit one where only road races bikes are permitted. The athletes have to physically touch to changeover at the end of each leg. 10:32 Russia's Anatoly Ryapolov has won the boy's long jump title. A leap of 7.54m is enough for the 2013 world youth champion, and pre-competition favourite, as he finishes 10 centremetres clear of Obrien Wasome of Jamaica. 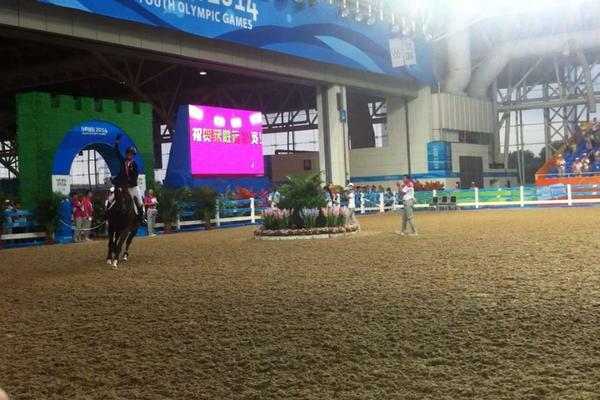 Zhong Peifing takes the first Chinese medal of the day with bronze. 10:28 The top seven finishes in that race all ran PB's. That's what happens when someone abandons tactics and really goes for it like that. Cracking stuff. 10:26 A brilliant first gold medal of the Games for Kenya as Gilbert Kwemoi Soet crosses the line after delivering a front-running masterclass. Have we just found ourselves a new distance running star of the future? A great celebration as well from the Kenya, who won in a PB of 3:41.99. In an East African clean sweep, Mulugeta Asefa Uma of Ethiopia was second, over three seconds behind, while Mohamed Ismail Ibrahim of Djibouti finished third. 10:16 Knockout action has begun today in beach volleyball, and boy's pairs from Thailand, Canada, Indonesia and Paraguay are all through. 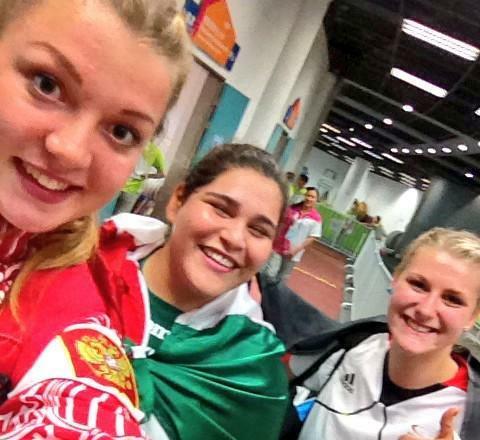 In the girl's events, there are wins for Puerto Rico, Argentina, Italy and Austria. 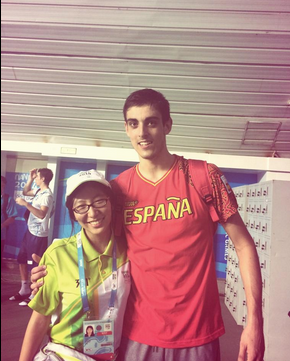 - Volunteer Liu Yuanjing obviously enjoyed meeting some 3x3 basketball players. 09:53 Our early leader after in the first round is boy's gold medal winner Renato Paratore, along with Virginia Elena Carta, for Italy. They are already on three under par, so one shot clear of duo's from Sweden and Australia. 09:48 Back to the sport, and golfing action is back on the menu here on day eight, with the beginning of the mixed team competition. The mixed team competition, like the singles strokeplay, consists of three rounds so a total of 54 holes. Teams, consisting of one male and one female player from the same country, will start with a foursomes round today - where the players take alternate shots - followed by a four-balls round tomorrow - where each plays a separate game with the best score counting. On the final day both the male and female individual scores will count. So some similarities with the Ryder Cup golf competition, the biennials clash between the best male European and US players, with the principal difference being that all the competition will still be conducted in a strokeplay rather than a one-on-one knockout matchplay format. "Team South Africa may not have won any medals at the Youth Olympic Games yet but they have won the hearts of the local population. Panayiotis Stais, father of the team's sole equestrian representative, Alexa, saved the life of a local citizen by diving into a river as she floundered helplessly this week. Stais, 54, was reluctant to take the focus off Team South Africa here, but told the SASCOC Road to Rio site of what went down at the riverside. 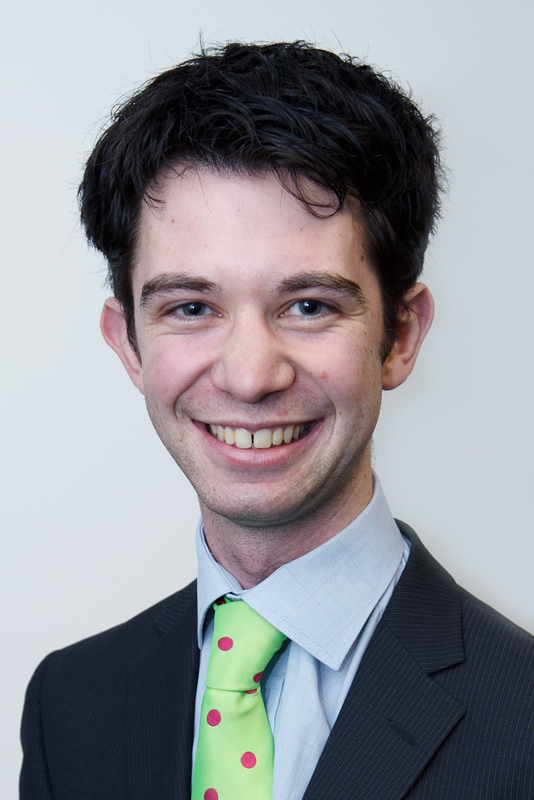 'We were having lunch at the Confucius Temple with some of the New Zealand equestrian crowd when I saw that someone had fallen in, about 60 metres away.' A former lifesaver, originally from Milnerton/Blaauwberg on the Cape's west coast but now living in Johannesburg, Stais reacted immediately. At the press conference, attended by a host of local media, Stais was presented with an official engraved certificate to commemorate his efforts. 'There was also a form of monetary reward which I asked the local authorities to donate to one of the local charities, something like trauma counselling for example. 'I really don't want this to take away the publicity for Team South Africa though. The focus should still be on the team and their performances but any positive media for the team is good I guess.'" - An update from SASCOS on the lifesaving endevours. 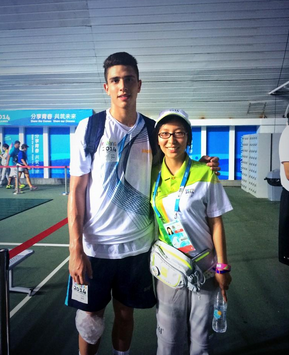 Congrats to all the athletes participating in the Nanjing #YOG Youth Olympic Games!! - IOC Athletes' Commission vice-chair Angela Ruggiero tweets her support. The four time Olympic ice hockey medallist from the United States is also the Head of the Coordination Commission for the next Youth Olympic Games, in Lillehammer in 2016. 09:34 The boy's long jump final has begun and we also have shot put action going on. A good PB by Guinea Bissau's Otoniel Badjana. He manages 17.71m. Belil has also, as predicted, won that 3,000m B race with a time of 9:44.90. 09:25 Morocco's Soukaina Belil has the fastest PB in the field and already she is in a leading group at the front after a swift opening lap of 73 seconds. That's a stroke outside nine minute pace in this seven and a half lap race, if they can keep it up. 09:23 We will focus on the sailing a little later on, but up first today it is athletics, and the girl's 3,000m B FInal. The A final will be up later on. 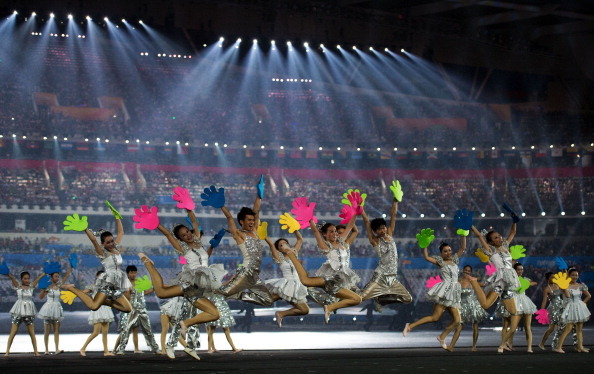 The athletes are from Morocco, Tajikistan, Cameroon, Algeria, Ivory Coast, Zimbabwe, Peru, Nepal, Lesotho and Malawi. 09:21 That picture was taken last night, with the athletics taking place in the big stadium in the foreground, and swimming, weightlifting, modern pentathlon and various other sports being held nearby.